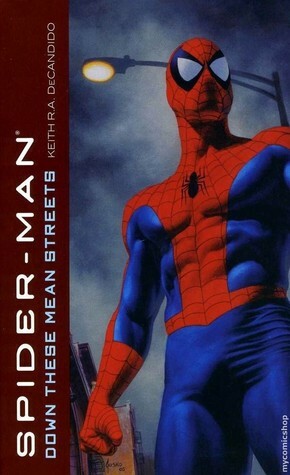 Perhaps it's just the shadowing but when I picked up my copy of 'Spider-Man: Down These Mean Streets' at the local bookstore I began to wonder whether Spidey had taken to carrying a weapon...albeit in his pants? Perhaps he was just overly pleased to be on the cover? I just don't know. What I do know, disturbing Spider-crotch aside, is that I thought it was a great piece of artwork and better portrayed the prose novel appeal to a more mature audience. Compare it, for instance, to Jim Butcher's 'Spider-Man: The Darkest Hours'which suffers from looking like a comic page drawn for kids but is actually another Spider-Man prose novel aimed at an older demographic. With such a cool cover and the story being penned by Keith R.A. DeCandido, known as Krad to his fans, I was eager to begin reading. Unlike most Spider-Man novels where he has a set villain to thwart Krad takes this novel into the realms of mystery by not revealing who the bad guy is. What we have instead is a new, designer drug named 'Triple X' (no, the side effect isn't that it makes one as dumb sounding as Vin Diesel) which is a combination of ecstasy and gamma radiation (yep, the stuff that turned Bruce Banner into The Hulk) and turns people into rampaging monsters. Spider-Man, mostly in the form of Peter Parker, sets about trying to solve who is behind the manufacturing of this drug, while working with the police to contain the outbreak, and it's only in the final few chapters that we find out the Spider-Man villain responsible. Although I enjoyed this approach the final battle between Spider-Man and the main villain is all too short and felt more rushed than any ending to a novel I can recall reading.It should be noted that Peter Parker no longer works for the Daily Bugle in this book but is a high school science teacher and, as such, some of the story plays out like an offshoot of the movie 'Dangerous Minds'. This isn't actually a bad thing as it grounds the story and adds a touch more realism to the proceedings and should make it more appealing to those who aren't huge superhero fans.So, all in all, what we have is a crime story mixed with teenage rebellion and angst, sprinkled with a healthy dose of mystery and topped off with some superhero frosting...quite the recipe. It's also one that DeCandido almost cooks to perfection but the story ends up a tad underdone due to a rushed Spider-Man/villain climax. And, let me tell you, if there's one thing I don't like in life it's a rushed climax! Ooer!! It is strange to read a comic book transformed into the medium of novel. The media are different, obviously, but DeCandido seems not to have given adequate thought to the differences. A comic book is similar to a short story, yet it has more characters. When writing a novel, fully explaining the background becomes more important. At times, DeCandido did this, but he was also being very careful to not break any new ground. He could not put anything in his story that was not already well established in the comic book series. Therefore, his story changed the character very little.On the other hand, the new medium demands some differences. The differences DeCandido went with were not well selected in my opinion. Chief among those were exploring Spider-man's relationship to the police. There is no real parallel to this in the comic book world. It doesn't feel right in the novel either.It sounds like I may be bashing the author for not making departures from the comics series and then bashing him for the one he does make. My problem is not that he makes the departure from the series though, just with the inconsequentiality of the one he ends up selecting. I am less interested in exploring Spider-man's relationship with the police than I am in exploring the nature of drug addiction and what a super-hero can really do about it in either identity.Not only that, but the ending of the novel didn't work for me. No big fight or use of super-powers. Just a super-villain surrendering too easily because the page count was getting up there and so the novel needed to be wrapped up.Despite the novel's flaws, I am giving it 3 stars because DeCandido has obvious writing talent, manages to portray the regular characters cast in a way that is consistent with the comic book and makes me care about the new characters he introduces, and does make some brave decisions in the book, such as to deal with gangs and drugs at all. Good book, though it had some proofing/formatting issues. For example, missing words, stretched letters, a few awkward sentences an editor should have caught. These errors distracted occasionally from the story, but for the most part I was immersed in this tale of Spider-Man/Peter Parker. The plot synopsis is what attracted me originally: designer-drugs that briefly turn people into superheroes or supervillians, but usually at great cost once they come off them. For most of this novel, this drew me in, but it didn't quite add up to a good climax. We readers never really knew the real game plan behind the supervillian, and there wasn't too much of a fight between Spidey and him. This feels either like the novel was supposed to be longer or the author wanted to mostly keep it with small "bosses" and use the police more. I wish he would have just chosen one or the other. Minor issues. The writing style also drew me in. Peter/Spidey has a bit of snark about him and geek, and I got this from this novel, in his interaction with his students. Except for a few awkward phrases I mentioned above, it read well.Another minor craft thing. POV. Though this was a Spider-Man/Peter Parker focused story, which is what it should be, the use of different POVs was interesting. I liked seeing Spidey through others' eyes, especially the police's eyes. MJ's role also felt relevant to the story. So that all worked.Overall, despite the ending and poor proofing, the story was well written, well-researched, and engaging. I'd read not only more Spidey tales by this author but other speculative fiction works as well. This was a fine Spiderman adventure. One way in which novels work well with the superhero genre is that they're not limited to so few words as are comics, and they aren't forced to be non-stop action as the films usually are. In this story not only do we see Spidey fighting villians, but we also see Peter Parker portrayed as a good guy in his own right, trying to deal with his job and marriage and such "mundane" concerns. Spider-Man: Down These Mean Streets is decidedly different from previous web-slinger novels in multiple ways. Not only does the plot involve drug use by minors, but the profanity count is much higher than in the movies or other books. For that latter reason, I must give this book a lower score. Older Spidey fans will find plenty to enjoy about Down These Mean Streets, but young teens and children should definitely stay away. This book is about a gang in New York City, giving out drugs laced with gamma rays to teenagers. After they take it, they get super powers with a time limit on it. When it reaches the limit, the kid would crash and his/her body would start to malfunction. It's up to Spiderman to stop the distribution of the harmful drugs and find who's behind it. A book that tries hard to faithfully show the lived experience of the people affected by the drug trade, but doesn't always quite hit it. As well, the plot kind of trails off in preparation for a sequel. Still, the attempt is appreciated. My introduction to Spiderman was also Electric Company, with only a few scattered ventures into the comic books. I got a much better sense of the main characters in the novelization. The plot moved well and wrapped things up nicely in the end. Always a welcome novelization to the inner-workings of the Spider-man psyche. This book isn't spectacular, but it never leaves the reader feeling like the story drags its feet. You average super-hero book. I wish they would've either left Spiderman's rival out all together, or made him more central to the story line. Felt kind of shoved in at the end. Awesome, simply awesome. So awesome, in fact, that it makes Ghost Rider look like Aunt May. Much better than one would expect from this sort of thing. Someone's seen The Wire. Not too great. I feel like nothing really even happened. He fought the villian like 1.5 times finally in the last like 75 pages..